I ought to have written this earlier this week but I have been busy and more than a little tired. 2013 was an off year election so there wasn’t much to really talk about except for a couple of interesting elections. First there was the New Jersey gubernatorial election. Chris Christie won re-election easily with 60.4% of the vote against his opponent Barbara Buono who had only 38.1%. This was expected. Christie seems to have been an effective governor and has remained popular in New Jersey.The Democrats did not spend much money in New Jersey, believing her candidacy to be a lost cause. In Virginia, Democrat Terry McAuliffe barely won the gubernatorial election with 47.7% of the vote verses Republican Ken Cuccinelli with 45.3%. This contest has been seen as a sign that the Tea Party has peaked and that only moderate Republicans have a chance to win in 2014 and 2016. I am not so sure. McAuliffe won, but by only a narrow margin. Obviously a large number of Virginians did not think that Cuccinelli was too conservative or extreme. Mark Levin believes that Cuccinelli could have won the race if he had gotten more support from the Republican Party at the national level. He could be right. It is increasingly obvious that the Republican establishment would prefer a Democrat to win rather than a Tea Party Republican. Conservatives who actually mean what they say about a small, limited government might disturb the cozy relationship they have with the Democrats. I would also note that the Libertarian candidate Robert Sarvis got 6.5% of the vote. If just half of the people who voted Libertarian voted for Cuccinelli, then he would have won. No doubt those Libertarians are congratulating themselves on not compromising by voting for the Republican, but the big government Democrat will be the next governor of Virginia. This is why a vote for the Libertarian Party is not just a wasted vote but is actually a vote for the Democrats. American politics is simply not set up for a third party and any vote for a third party turns out to be a vote for your ideological opponent. I do not believe that the key to a Republican victory in the next elections is running “moderate” candidates. The problem here is that “moderate” candidates are usually the wishy-washy candidates who either don’t believe in anything, except getting elected, or are too cowardly to stand up for what they believe. Christie is not, in fact, all that moderate, except on social issues. Many conservatives suspect him because he has said nice things about Obama, but on fiscal matters, he seems to be quite conservative. More importantly, he does not shy away from confrontations. A Republican candidate for any office who is honest about his beliefs and willing to stand up for them, regardless of the inevitable hostility from the media, can and will win. Its these candidates who feel they need to apologize for being conservative that lose. Finally, in New York City, Democrat Bill de Blasio won a landslide 73.3% vote to become the next mayor. This is unfortunate. de Blasio seems to be very liberal, even verging on Marxist judging from his support for the Nicaraguan Sandinistas back in the 1980s. His election may result in the undoing of all the work his two immediate predecessors have done in turning New York into a livable city. At the very least the class warfare rhetoric will encourage business to locate elsewhere and it seems likely that he will hobble the NYPD. Well, the New Yorkers wanted him. They will get what they deserve. RON PAUL: ‘Insane’ to vote for libertarian candidate in VA… (breitbart.com) He ought to know about insane. Chris Christie Is Showing Conservatives How to Win – Bloomberg (bloomberg.com) Actually he is. New Jersey Governor Chris Christie had something to say about the “strain of libertarianism going through both parties” while attending a meeting of the Aspen Institute. Here is the story in the Washington Post. New Jersey Gov. Chris Christie (R) on Thursday offered a clear broadside against Republicans drifting toward a more libertarian view of foreign policy, lumping Sen. Rand Paul (R-Ky.) in with them and suggesting they explain their position to victims of the Sept. 11, 2001, attacks. The House earlier this week narrowly voted against a reduction in funding for the National Security Agency’s program collecting Americans’ phone records, as libertarian-leaning members from both sides joined together to vote for the amendment. Asked whether he includes Paul — a fellow potential 2016 presidential candidate — in his criticism, Christie didn’t back down. Christie acknowledged that there will always be mistakes when it comes to national security and protecting privacy, but said Americans need to stay focused on what’s at stake. We do need to have more of a pubic debate on what balance between freedom and security we, as a nation, want to take. I am nervous about the direction things are moving in, but I am not sure if my concerns are quite the same as Christie’s. While I certainly do not want another terrorist attack on the scale of 9-11, I also do not especially want to live in a country where Big Brother is watching my every move. Frankly, I would rather take the risk of a terrorist attack to having to live with the level of surveillance that would make such an attack impossible. I mean, you never hear about terrorists attacking North Korea, but who would want to live there? There is also the question of how well the NSA’s surveillance is actually working. They didn’t prevent the Boston bombing. They didn’t prevent the attempted car bombing at Times Square, or the Shoe Bomber, or the Underwear Bomber, or the attack at Benghazi. It is possible that for each one of these acts listed, the NSA anticipated hundreds of attempted attacks, yet how can we know? I remember how I felt on September 12, 2001. I also know that immediately after a crisis is the worst possible time to consider any legislation to address that crisis. While emotions are still high and everyone’s afraid, stupid and ineffective laws are likely to be passed without close examination. This is why politicians love to pass laws immediately after a crisis. They also love to drag out widows and orphans to pull on the heart strings and evade any rational examination of whether any proposed legislation is working as intended. Christie worries about the dangers of freedom. I worry about the danger of losing that freedom. Spying without warrants is unconstitutional. I worry about that too. Christie appeared alongside Wisconsin Gov. Scott Walker (R), Louisiana Gov. Bobby Jindal (R) and Indiana Gov. Mike Pence (R). The four GOP governors appeared side-by-side at a session hosted by the nonpartisan Aspen Institute. The four of them — along with Paul — are all considered among the GOP’s top potential presidential candidates in 2016, with each of them ranking on The Fix’s most recent list of the top 10 likeliest nominees. If Chris Christie keeps going the way he has been, he might not continue to be among the GOP’s top presidential candidates in 2016. He certainly won’t deserve to be. I saw this just now on Yahoo News. A New Jersey woman arrested for allegedly putting her 5-year-old daughter in a tanning booth says it was all a big misunderstanding. Patricia Krentcil, 44, told NBC’s local New York affiliate that she took her daughter with her to a local tanning salon but that the child was not exposed to the booth’s synthetic UV rays. Krentcil, of Nutley, N.J., was arrested last week, and charged Tuesday with felony child endangerment. She was released on a $25,000 bond and is due in court Wednesday. 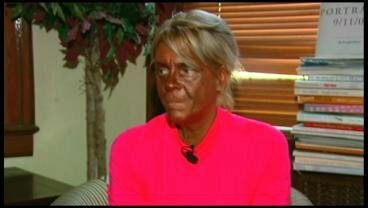 Police, though, say Krentcil put her daughter in an upright tanning booth. New Jersey state law prohibits children under the age of 14 from tanning booths. Children between the ages of 14 and 17 must be accompanied by an adult. Rich Krentcil, the girl’s father, told NBC the teacher misinterpreted his daughter. I don’t know what the facts in this case are, but judging from the picture of the mother, I would say she is the one that needs an intervention. I don’t think that I have ever seen a human being with skin quite that shade of red-brown before. Indiana is the third freest state in the union according to this report from the Mercatus Center at George Mason University. They rank the states in order and Indiana is number three, right behind New Hampshire and South Dakota. California, New Jersey and New York rank forty-eighth, forty-ninth, and fiftieth, which isn’t much of a surprise. Our neighbors Illinois and Ohio rank forty-one and forty-two, while Kentucky is thirty-two.